The March 14 is just around the corner. And why is space that day? Because Samsung has decided to present its next star terminal: the Samsung Galaxy S4. Meanwhile, more information continues to come about possible technical characteristics. According to recent rumors, the Asian giant bet on wireless charging terminal but through special housings. Each year, Samsung surprised the public with new launches in the mobile phone sector. It was learned that the manufacturer did not intend to submit its next flagship in Barcelona during the celebration of the exhibition Mobile World Congress, the space was reserved for a new member: the Samsung Galaxy Note 8.0. 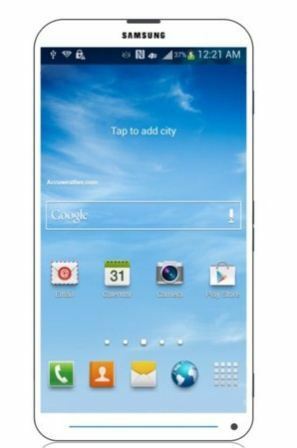 A few days later, it was confirmed that the presentation of the new Samsung Galaxy S4 would be in New York on March 14. And so far it has been known about its screen, its processor, the version of Android that would installed. And now, it has also come through the portal information DigiTimes, which is referred to a possible wireless charging interest. Apparently, Samsung Galaxy S4 sell it without this function, it is possible that not all the public is interested in this technology. So the manufacturer would have opted for a strategy similar to that of Nokia with its Nokia Lumia 820. What is this? To offer customers the possibility of wireless charging-not having to be plugged into a charger cable conventionally through backshells with that function. Put another way: today is not a compulsory subject, so that the final decision rests with the user. Also, some time ago there came a Samsung charger that boasted of this new technology that was christened Qi. There is only one induction charging with which the terminal is placed on an ad hoc basis and the load begins to act on the device instantly. Moreover, this feature is getting a lot of attention in Nokia handsets with Windows Phone. Now, Samsung continues its secrecy and let all the news saved for next week. But what is currently known of Samsung Galaxy S4? First, one of the surprises for this year 2013 was the decision to reach the touch screen new submissions. And in this case, the panel would reach resolution 1920 x 1080 pixels: resolution Full HD. Also, the diagonal measure would supposedly-five inches, continuing the trend of the company to enlarge their devices in each new release. Meanwhile, in the power pack that Samsung will decide to include the eight-core processor created by herself and would be accompanied by two gigabytes of RAM. As for the operating system, Samsung Galaxy S4 could be the first Korean mobile to show Android 4.2 Jelly Bean. Moreover, it said that the Samsung Galaxy S3 receive the update after the device’s presentation in New York.